Sega have done us RPG fans proud! Up until now we have only had two good RPG’s on Dreamcast, Phantasy Star Online and Shenmue. These games set a standard, a new form of gaming, maybe how gaming should really be, or how it will be in the future. They blew all competition out of the water, trampling on any ‘old’ style RPG that got in their way. 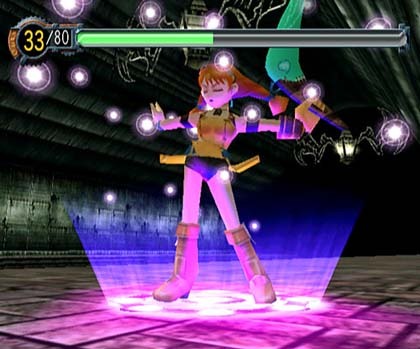 The developers realised that it was time for RPG gaming to be taken to the next level, for PSO, that would be the online capabilities, and for Shenmue, that would be the amazing story line, the true reality of the game and the breathtaking visuals. The rulebooks were scrapped and RPG gaming as we knew was slowly disappearing into the midst. With all this ‘New Found’ gaming going around, It’s hard to understand why Sega went back to basics, but once you pick up that pad, all fears of this game being another tired old Final Fantasy game are quashed. Yes, I will admit there are similarities between the two, but that’s a strong point for this game. Basically, Sega have gone old school on this marvelous piece of gaming wonder. 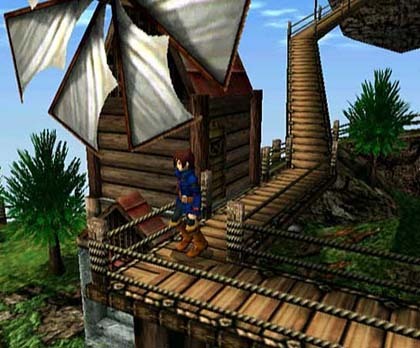 It’s a game based on the story of Vyse, a Blue Rogue Air Pirate, who’s life starts to get a bit more difficult upon rescuing a mysterious girl from the clutches of the Valuan Empire (the main enemy in the game). I won’t say anything else about Fina (the mysterious girl) because doing so would jeopardise the story, but it wouldn’t hurt to mention that sparks seem to fly at times between the two of them. To tell you the truth this game plays a lot like Final Fantasy 7, with its battle format, its adventuring, its use of magic, weapons, etc. But in nearly everyway it perfects what FF7 was trying to do. 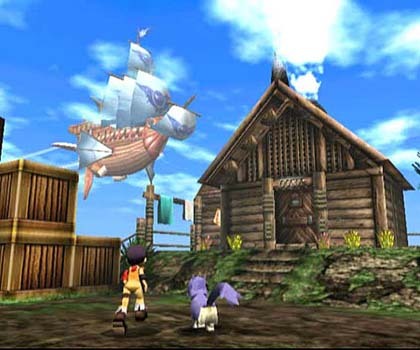 For example, the graphics, well, what can I say, they amaze from the start, the first time that you get to leave Pirate Isle (Vyse’s homeland) you have to find a moon stone which has fallen on another island , and when you get there, the view is truly breathtaking. Amazing water effects, lighting effects are just mind blowing, its all too much for me, sniff sniff, ooh, I got something in my eye. 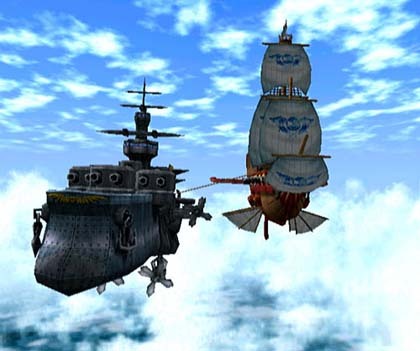 The skies of Arcadia world is a huge world that consists of Islands in the Sky, and anything below the clouds is a mystery, and it is Vyse’s ambition to see what’s under those thick, foggy clouds, will he get the chance in the many adventures that pass his path? Buy the game, give up your social life and find out! 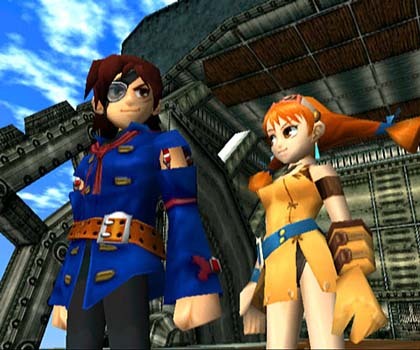 Your partner in-crime Aika, is a tough, rough and ready type of girl who has huge confidence in Vyse, and stands by him no matter what. Now then, a lot of people think that RPG scenarios are no longer original, how can they be, everything that was original was used in Final Fantasy, Shenmue or Zelda. But that’s not the case, Skies is a purely new and original game, however it does borrow some elements from the above games. One of the best features of the game is the secondary battle system. This only comes into use when your in the air and you fight another ship, its not like a normal battle, although each ship does take turns to make their move. Delving deeper in the game you’ll see that when you battle an enemy, there are 2 main factors affecting your health, HP (hit points) and MP (magic points). Hit points are reduced when you take damage, and can be regained by using a sacri or crystal or one of the many ‘natural’ magic spells that your character will learn. Magic points decrease when you decide to use a spell, and let me tell you, there is a HUGE choice of spells and just about every character can use them. The game is based around your quest to firstly rescue your father and town folk moments before their execution in Valua (headquarter of the Valuans) and secondly to find the 6 moon crystals in the overworld in order to stop the mighty Valuans from taking over civilisation. I completed the first quest within 7 hours, and am still on the second quest, even after 32 hours of the game, and it seems to me that I’m nowhere near the end of the game. So the good news is that the game is not short lived. One of the only bad points in the game is the battles you encounter. 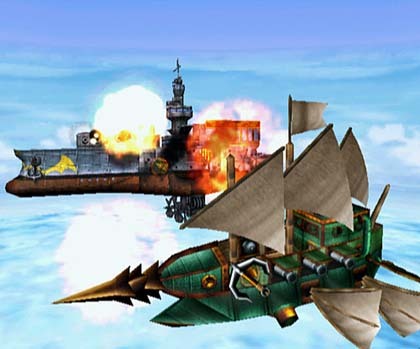 Maybe its just me, but really, you’ll notice that you get into far too many fights, maybe its just Vyse’s rough look, and this can be really annoying as sometimes all you want to do is get to your frikkin destination but you can’t help all the battles you encounter. On the whole, I don’t think I have a bad word to say about this game, as it is one of the most perfect games I have ever played. Out of all the RPG’s on the Dreamcast, I think this is the one I would recommend to anyone. 8.5 Outstanding. For an RPG the scenes are breath taking! Sound 8 Somewhat influenced by Japanese manga sounds, but in a good way! Gameplay 10 Excellent story line, the characters really grow on you. You will get at least 50 hours gameplay out of this, its so gooood! "Definitely one for the RPG fans, I love it to bits!!"